The fast-paced life of a busy executive can clearly seem out of control when viewed by the casual observer. These driven professionals aim for the top with an über-focused fervor, fueled by the passion to succeed at their chosen career. What many do not see, however, is the coping method used to quiet their sky-high stress level: alcohol. 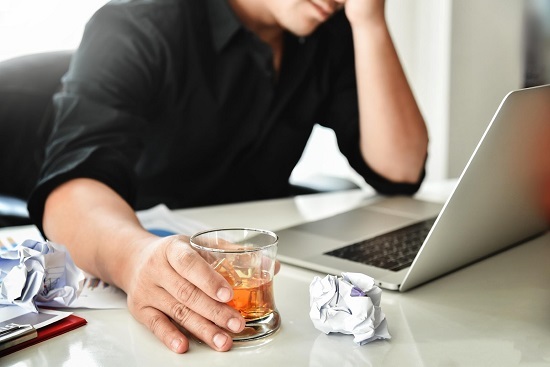 Workaholic and alcoholic—these two terms conjure up a harried, compulsive, type-A individual with a bottle of booze hidden in the desk drawer. Relying on a nip here or there throughout the day can morph into a much more serious problem as tolerance to alcohol’s effects increase, demanding more than a nip to reach the calm state desired. Therein lies the problem; the use of alcohol to induce relaxation due to job stress and anxiety can end up backfiring in a big way. As the need for higher levels of alcohol consumption incrementally increases, the brain, in turn, is busy altering neurotransmitters and neural pathways in response. This invisible process can creep up on a person, when suddenly, one morning, the first signs of a problem are evident. Maybe it is hand tremors. Maybe it is nausea or profuse sweating. Whichever the withdrawal symptom that initially emerges, this is the warning sign that alcoholism is taking root. The workaholic and alcoholic tend to exist side by side. 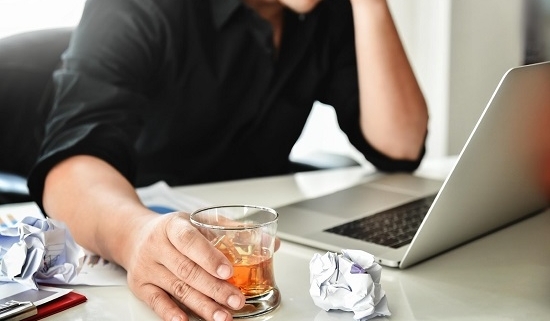 The same traits that might cause a person to become addicted to their work parallel similar traits observed in the alcoholic. The reflexive mechanism that drives compulsive behaviors involves both the mind (cognitive) and actions (behavioral). Cognitive Behavioral Therapy (CBT) is a mode of psychotherapy that helps individuals who struggle with compulsions, whether they be work or alcohol consumption, learn how to shift the thought-behavior patterns away from self-destructive actions toward productive, healthy actions. CBT guides the individual to identify the distorted self-messaging that is acted on through subsequent alcohol abuse or the compulsive working. For example, a workaholic may tell him or herself that “unless I put in 18 hour days I will never be promoted,” which results in compulsive work actions. An alcoholic may tell him or herself that “No way can I deal with the pressure of this day on my own,” which results in compulsive alcohol misuse. By reframing the internal dialogue, CBT can help individuals make fundamental shifts in their thought-behavior patterns. It teaches the person to be mindful of the moment, to pause and shift the thought toward a positive message. For example, the workaholic may feel a rush of anxiety around career advancement. This feeling is acknowledged, then followed with “I will continue to deliver my best work while remaining cognizant of my own wellness,” which results in self-regulation of work hours. The alcoholic might feel overwhelmed by anxiety in a given situation, and pauses to acknowledge this mental state, followed by the thought “I need to do some deep breathing right now and rein in my thoughts to this present moment.” This results in active efforts to calm the mind using both mindfulness and deep breathing, which will result in decreased cortisol and adrenaline and a calmer state of being without resorting to alcohol. CBT is a highly effective therapeutic strategy that produces significant results in a short-term format. CBT can be used in both individual and group settings, and is a core treatment element in addiction recovery. It isn’t easy to accept that one may have developed a problem with alcohol. When those first withdrawal symptoms appear, it can come as a shock. But the fact is that the earlier someone seeks treatment for an alcohol use disorder, the better their recovery outcome. Alcohol addiction will only escalate toward alcohol dependency, which is a chronic, relapsing, and usually fatal disease. Detox. When approaching treatment for alcoholism it is important to understand that the first step in recovery, detoxification, must be completed under the supervision of a trained medical detox team. Attempting to detox on one’s own can present serious, even fatal, health risks, including the seizures and coma associated with the delirium tremens (DTs). Alcohol withdrawal symptoms will vary in severity depending on such factors as the length of time abusing alcohol, the level of alcohol consumption, presence of a coexisting mental health disorder like depression or anxiety, a polydrug addiction, and the general health status of the individual. Treatment. Alcohol treatment can be obtained in either an outpatient or residential setting and will involve a number of coordinated therapies. Rehab usually includes individual therapy, group therapy, family-focused therapy, medication management when applicable, addiction education, relapse prevention planning, adjunctive therapies, recreational therapy, nutritional counseling, and holistic activities. Aftercare. Following completion of the rehab program, the individual should access continuing care services to help reinforce sobriety. These include ongoing outpatient therapy, sober living housing, and 12-step or non 12-step meetings. Golf Drug Rehab provides the most effective evidence-based therapies for treating alcohol use disorders, as well as naltrexone therapy, in some cases, to further reinforce recovery. Learn how to free yourself from life as a workaholic and alcoholic while also enjoying three spectacular golf courses while in treatment. For more information, please contact Golf Drug Rehab today at (877) 958-5320.